When in Paris, you can’t miss the Eiffel Tower. However, there’s more than one way to see this famous landmark and not all of them are enjoyable. Take our trip for example. 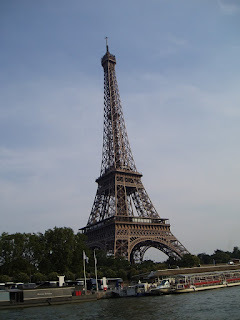 My husband and I were visiting the City of Light with our then seven and ten year old boys. Of course they wanted to go to the top of the Tower. It was July and we knew there would be line-ups but a web site suggested going either in the early morning or at night for shorter waits. At 8:30pm we stood in a long line-up to buy tickets. Over an hour later, we finally purchased tickets to go all the way to the top floor. The kids were already restless. To add insult to injury, we had to stand in line for the elevator to take us down! That night we dubbed the tower, The Awful Tower. Not wanting to leave Paris on bad terms with the Eiffel’s masterpiece, we decided to try one more time. We packed a picnic snack with a nice bottle of wine and at 9:55pm, went to watch The Eiffel Tower’s light show from Trocadero. Other people had the same idea and the decks were packed. About three minutes before the light show began, the sky opened and warm rain pelted down. That cleared the place out fast. Only our family and another couple remained. Through the downpour, the lights came on and the Iron Lady twinkled like a diamond beacon. Lighting flashed around the tower, adding extra drama. What an intoxicating sight! Although soaked we laughed, sipped wine and the boys danced in the rain. It was magic. In 2008 almost 14 million people visited the tower. The 10 minute light show takes place once an hour from sunset to 1:00 am, (2:00am in the summer). Check the website for times. Finally, the Eiffel Tower added the option to buy tickets on line. Go to the official Eiffel Tower website to check out Tower facts and history, show times, ticket prices and to buy your tickets on line.